Stereo Microscopes enable 3D viewing of specimens visible to the naked eye. They are commonly known as Low Power or Dissecting Microscopes. An estimated 99% of stereo applications employ less than 50x magnification. Use them for viewing insects, crystals, plant life, circuit boards etc. 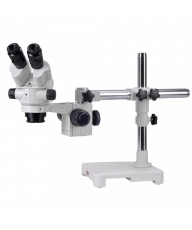 Dual Power Magnification: Dual Power stereo microscopes provide two or more fixed levels of magnification at a more affordable price, without sacrificing optic quality. The two most common types are 10x/30x and 20x/40x. Simply rotate the objective housing to click into the desired level of magnification. 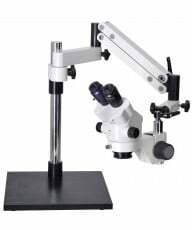 Dual power are excellent starter microscopes. Zoom Magnification enables you to zoom, conveniently through a magnification range, similar to binoculars or an SLR camera. Some have detents or click stops at intervals through the zoom range so that you can quickly return to a precise level of magnification in the zoom range. Focusing: When viewing a solid or opaque object, only use the incident (top) light. Use the bottom (transmitted) light for more transparent specimens. 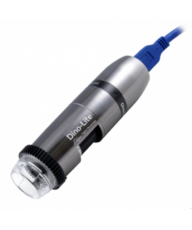 Most stereo microscope applications require only the top light. 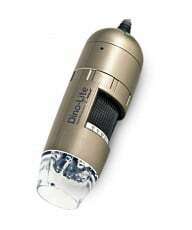 Barlow Lens: You can use an optional Barlow or Accessory Lens to alter the focal length of your microscope, and therefore, the magnification power, field of view and working distance. A 0.5x Barlow lens, for example will halve a given level of magnification while doubling the working distance. 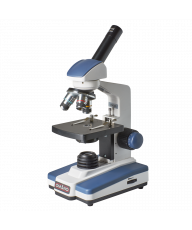 Should you buy a stereo or compound microscope for your child's first microscope? Read this article Compound or Stereo? for further guidance.